The opposite of love is not hate, but indifference. This is not just a lyric in a Lumineer’s song, but a universal truth that could be applied to love’s sister in virtue: faith. The opposite of belief in God is not in fact that long despised enemy of godly people everywhere, atheism. The enemy of belief, rather, is run of the mill indifference. This notion is given credence by Tommy O’Haver’s “The Most Hated Woman in America,” a recent film from Netflix. The film goes a long way in arguing that atheism isn’t the converse of theism, but just another shade on the color wheel of belief, with all the pageantry and chaos which that frequently entails. 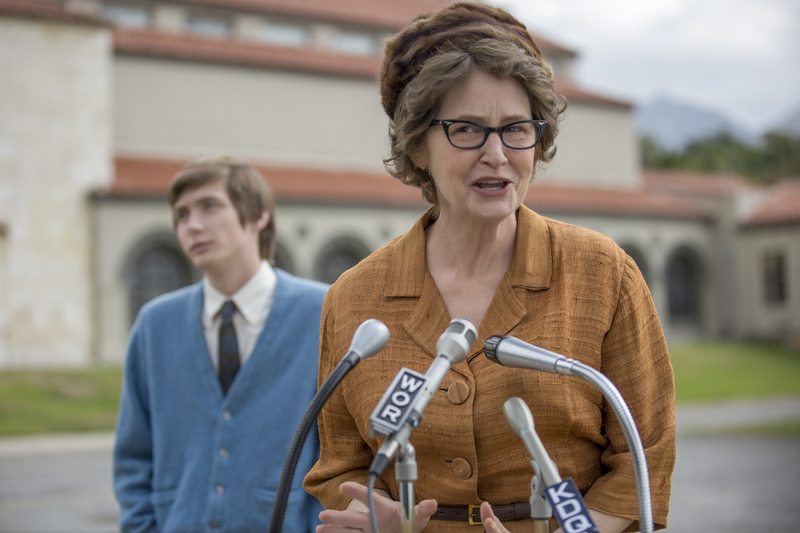 The film tells the (true) story of Madalyn Murray O’Hair (Melissa Leo), a woman who garnered notoriety in the early 1960s for suing the Baltimore public school system—a move that ultimately led to a Supreme Court decision banning mandatory bible reading in the public school classroom. O’Hair then went on to found American Atheists, a national organization dedicated to advocating for the rights of atheists, while continuing to work toward ensuring the separation of church and state. In the summer of 1995, O’Hair, along with her youngest son and granddaughter, was kidnapped and murdered by a former employee of American Atheist. Eventually it came to light that the murders were an attempt to seize the substantial amount of money O’Hair had laundered into offshore accounts throughout her time at American Atheists. The film’s primary thrust is exploring the “what,” the “why” and the “how” of O’Hair’s kidnapping and murder. Outside of the Supreme Court case that first brought O’Hair to the public’s attention, O’Hair’s activism on behalf of the atheist agenda is paid little heed by the filmmakers. The audience is left with a paint-by-numbers look at the seemingly inevitable corruption that bubbles to the surface when a grassroots movement turns into an organized institution. Peter Fonda and Melissa Leo in "The Most Hated Woman in America"
O’Hair quickly discovers the financial benefits that come with being the face of a belief—or non-belief movement, as it were. “Most Hated” makes a point of highlighting her collaboration with televangelist Bill Harrington, which consists primarily of their questionably authentic debates for and against religion, put forth for public consumption in the style of P. T. Barnum, and—more importantly—designed for profit. Melissa Leo as the hard-to-love O’Hair gives integrity and complexity to a character who could have easily been played for laughs. She never condescends to O’Hair and gives authenticity to a volatile and larger-than-life woman without overplaying or veering into camp. It is unfortunate that the rest of the film cannot live up to Leo’s incredible work, as the production values are shoddy and the writing is strictly TV-movie-of-the-week. The remainder of the cast’s talent—which includes Peter Fonda, Juno Temple, Josh Lucas and Adam Scott—is wasted in a film that primarily plays like a poorly done imitation of a Coen brothers’ film. The fundamental reality seems to be that we need some kind of hero, or vaunted ideal (be it Jesus or Never Jesus) to give some sort of shape to our existence. O’Hair’s story does, however, raise questions worth investigating. The most significant: Can a deeply embedded commitment to unbelief avoid mirroring the very thing it opposes? It would seem that any cause worthy of faith and commitment cannot help but become organized, incorporated and hierarchical. An ideology, a faith, a movement, always begins rather formless, even chaotic, necessitating a leader to give it shape, be it Jesus, Lenin or Madalyn Murray O’Hair. As dark a gloss as “Most Hated”tries to put on organized movements, the fundamental reality seems to be that we need some kind of hero, or vaunted ideal (be it Jesus or Never Jesus) to give some sort of shape to our existence. And we like to run in packs, or prides, groups, coteries, sects, denominations, religions, take your pick; but whatever you call them, we like to be a part of them. We like to be a part of. The reality is that people need something to believe in, even if that very thing just happens to be unbelief. Atheism is a fashion and for some it may be a belief system but it is held for incoherent reasons. I have been engaging with people who identify as atheists on the internet for almost 20 years. None have ever provided an intellectual basis for their beliefs. It was just what they said they believed and is mainly based on denigrating other's beliefs. Thus, it is mainly an argument against mainstream beliefs systems. Atheism is intellectually bankrupt but you won't see too many atheists agreeing with such an assessment as many of them look at themselves as logical thinkers who base their beliefs in science. However, they cannot justify their beliefs when pushed. If you want to experience double-talk, debate an atheist. That does not make Catholicism, Christianity or any other religion necessarily true or even rational. What it does mean is that the belief that existence is happenstance or random is not a logically coherent position. So should one have an obligation to find what is the one coherent belief system because logically there can only be one? Good luck because few will want to do that. My experience is that Catholics rarely try to do this and I have not seen one author on America ever try. The thing is... I don't think it even requires science because the whole concept of religion, or spirituality for that matter was never supposed to provide an empirical understanding of the world. At best, it is storytelling. There is no need to conduct a scientific inquiry into Zeus, ironman and Winnie the pooh, just as much as there is no need to enquire into a diety. I fail to understand the logic of having to gather all empirical knowledge to debunk fiction. People get emotional and sentimental over what simply does not exist! It is so frustrating when people say, why don't you believe? Like duhhh! There is no reason, at all, to believe. There is also no reason, no evidence, no need for a creator, be it self aware or not. It is really not that hard to see that the universe is indifferent to your wishes, you have to work with what you have and be practical about it. You can be wishful, but remain sane. Prayer does not feed or protect children in Sudan. It just doesn't. And we could go from Cape to Cairo to Chicago and back to the same point, superstition, is just that, superstition. The foundation of religion is imagination, "faith" is a nice way to dress it up, but it all starts with accepting to be true... what is not true, acknowledging the presence of what doesn't exist, and stretching truth to a point where truth CANNOT BE DISTINGUISHED from a lie, truth is no longer something that everybody can have access to, it is now exclusively held by "anointed" or "chosen" figures and they are the ones to meant to dispense it . Religion just has no truth to it, there are no indicators of it even being possibly true. You can be an atheist, simply because religion is a lie. J Cosgrove writes (rather uncharitably, I must say), " I have been engaging with people who identify as atheists on the internet for almost 20 years. None have ever provided an intellectual basis for their beliefs." Well, firstly, Mr. (Ms?) Cosgrove, it's not surprising that you haven't been able to pin down an atheist to "their beliefs", since atheism isn't a set of beliefs. It is disbelief or the lack of belief in a god or gods. If you don't even understand that, then I have to assume your engagement with atheists was superficial at best. As for what I have to assume you're trying to get from them - i.e. an intellectual basis for atheists' lack of belief in God, well that's easy. The intellectual basis is the necessity of evidence as a precursor to belief. If you don't have evidence, you don't have a reason to believe, and there is no evidence for any god. There are lots of claims, but no actual evidence. If anything is intellectually bankrupt, it is the idea that we should believe despite there being no evidence - i.e. on faith alone. That is a recipe for disaster, and it is evidence of a complete lack of intellectual rigor on the part of the believer. It is, in point of fact, the exact same philosophy that prompts a person to buy based on the statement "Well, if you believe that, I have a bridge to sell you." If you want to attack atheism on rational grounds, I think you ought to make sure that you're speaking (or writing) in an echo chamber. When atheists can respond, it's going to end badly for you. If you want to defend your faith (and given the fact that it is in severe decline, it certainly needs defending) I suggest you avoid the intellectual argument - it's one you can never win. Go for the basest emotions - fear and hope - threaten unbelievers with Hell, promise believers eternal life in a Heaven of their most wonderful imaginings. People tend to be weak and frightened, so that is much more likely to work. Engaging on rational grounds will tend to kindle their intellect, and that's not going to have good results if you want to make them believe or keep them believing. To be honest, I expected better than this from a Jesuit website. The only Jesuit I ever met seemed a very nice guy. Now, thanks to you (and since you're writing here, I have to assume you're a Jesuit, or at least a person who models his life on that philosophy), I have another point of data. It contradicts the first point, which is, I think, a shame, as it skews the data very far from the place it used to be. I would urge you to try to be a better person - try to see the good in people, rather than assuming the bad. Atheists are not bad people (as prison population statistics can attest), and we are far from unintellectual (as our pronounced tendency to be over-represented in the sciences can attest). In mischaracterizing us, you do yourself and your faith a disservice. So I guess you claim to be an atheist since you used the word “us.” What do you believe? I don't want to get into a long discussion with you on the basis for whether a creator exists or not. Essentially the atheist has to believe something. What you describe as a lack of belief will not fly very long. Eventually everyone must believe in something. What the atheist generally will say is that stuff, the particles of physics in various iterations, have existed forever and in that time which is infinite, what we see around us somehow popped, emerged or evolved into the universe we observe based on the laws of physics. So they believe things. It is not just a system of disbelief. No serious atheist will just say they disbelieve in a god because that is an admission that their beliefs are not defensible. They may say as you have done that they do not believe there is evidence of a god. But have you looked? But in having discussions with them for about 20 years on the internet since that is where I have met them, not one has ever been able to rationally defend their belief position. They say they don't believe in a creator. Well fine and good but how do you explain a, b, c, d, e, f, g etc. The only logical answer to all this evidence is that there is a creator. They really don't have an answer. They just say it somehow happened and eventually science will explain each one. But as of now science has not explained them and new findings in science make it less likely that all these things have just happened due to the laws of physics. And by the way they cannot explain the laws of physics. The laws are very precise. The typical response is that they attack those who believe in a god or gods as illogical or nonsense or based on blind assertions as you have as opposed to try to defend what they believe. That is not a defense of atheism but as I have said an admission that their beliefs are not defensible. And by the way I would not bring up evolution. Science has no answer for how new species with major new capabilities could have ever come into existence let alone how life could have developed. It is a best a major mystery. If you think that neo Darwinism (or its latest version) explains every thing, then you must believe in fairly tales. And there are several other mysteries. All easily explainable if there is a creator but not by any random process. And by the way the atheist must believe the process of evolution is random because they do not want to get into anything that is designed. What do I believe? I believe things that are based in evidence. I believe the universe is about 14 billion years old and that the Earth is about 4.5 billion years old. I believe in democracy, because it's the fairest system of government we know. I believe in treating living things kindly, because they all may have the capacity to suffer, and I may be able to prevent that. I believe lots of things - so many that I could fill many books, but I don't think you want a list. What is your point? You seem to want to tie belief to atheism, but it just doesn't work that way. Every atheist is different, because atheism is ONLY the lack of belief in a god or gods. Everything else is changeable - there are Republican atheists, Democrat atheists, anarchist atheists, libertarian atheists, atheists who believe in ghosts, atheists who don't believe in ghosts. Atheism just is not a set of beliefs. It just isn't, and no matter how hard you want it to be, it will never be that. And again, you claim that atheists haven't been able to defend "their belief position". THERE IS NO BELIEF POSITION FOR ATHEISTS. IT IS A POSITION OF NON-BELIEF. Why is that so difficult to accept? And as to the accusation that atheists don't know certain things, yes, that's true. But unlike people of faith, we don't claim to know things we don't know. And yes, science will probably come up with an answer, because science actually has a method that's proven to work in terms of finding truth. It's the ONLY reliable method we have for doing that. You say, "The typical response is that they attack those who believe in a god or gods as illogical or nonsense or based on blind assertions as you have as opposed to try to defend what they believe. That is not a defense of atheism but as I have said an admission that there beliefs are not defensible." This is a particularly confusing couple of sentences. The grammar, spelling and other problems make it impossible to figure out what you're trying to say here, except that you seem to think it's unfair that atheists attack believers. No. It isn't. If you believe something, you have the burden of proof - you need to show why you believe it, and if you can't, you need to understand that people will be correct to dismiss your claims. Besides, criticism is a GOOD thing. It gives you a chance to defend your faith! Also, you once again bring up the idea that atheism is a set of beliefs. Again, no - it isn't. And I must say it's somewhat hypocritical for a person whose entire first post here was an attack on atheism to complain about atheists attacking people of faith. The words, "Judge not, that ye be not judged" come to mind, "For with what judgment ye judge, ye shall be judged: and with what measure ye mete, it shall be measured unto you again". I suspect you know who said that. It's a pity you don't take it to heart. I was assuming you were a Christian. If you don't follow Jesus, whom do you follow? And as for your assertion that "Science has no answer for how new species with major new capabilities could have ever come into existence", well, that is wrong. Science has an answer - or rather a hypothesis - a number of them even - all based on reason and evidence. Science has even shown, in the Miller Urey Experiment, how the building blocks of life formed. Science just doesn't have a theory that explains it - and neither does religion. "God did it" is just a guess, and it has no evidence whatsoever to back it up. If you believe in something, one must have as you say, evidence for your belief. I maintain in nearly 20 years of discussions with atheists, I have never seen any evidence for an atheist's beliefs. You are certainly entitled to say you are an atheist but you like all the previous atheist I have encountered have not provided evidence for your beliefs. One cannot use the foolishness of others as a basis for one's own beliefs so if a lot or most theists present what one considers foolish or superstitious rationales for their beliefs that does not make the belief in the opposite true. Theists have a very detailed presentation of evidence that they believe supports the position that there is a creator with immense intelligence. Mainly it has to do with the origin of extremely complicated and fine tuned entities in existence. Here is a partial list of origin examples which no one has been able to explain without a creator but would exist if a creator was involved. 1. Why does anything exist? This is the greatest question of them all. 2. Why does the universe exist with such fine tuned laws governed by dozens of precisely determined constants governing the interaction of the basic particles? There are several books on this and I suggest you read some. 3. Why does life exist? Life is an incredibly complicated organism with thousands of very complex machine like parts that work together to produce a system for reproduction and persistence of the organism in some very harsh environments. 4. How have new life forms appeared over time that have major new capabilities that require the working of tens of thousands of new complex machine like parts that work together to form these capabilities? No biological process can explain this. 5. How did the Earth happen? We just assume that the Earth is one of millions of such planets in a universe that contains hundreds of billions of planets. But Earth possesses properties that likely mean that no other planet like it exists. Earth is extremely fine tuned for supporting life. 6 How did consciousness arise? No one has an explanation for consciousness and the ability of entities with it to interact with other organisms around it that is not attributable to the forces of physics. 7. How did mankind arise? The traditional answer is the humans are just smarter apes does not hold up when comparing the capabilities of each and there seems no pathway from one to the other via any known biological evolutionary processes. So it seems that the scientific evidence is on the theist side and not the atheist side. You can continue to believe in atheism but there is no evidence for it. Also please don't denigrate the theist position because there is a lack of evidence because it is just the opposite. There is a tremendous amount of scientific evidence supporting it. I have purposely stayed away from philosophical arguments but there is a large literature on this as well. There is no evidence of an atheist's belief because (in reference to god) an atheist doesn't have a belief. An atheist simply takes the claim “god exists” and says the evidence isn't good enough to accept that claim. If you believe in the Christian god...you are an atheist in respect to all of the other gods proposed currently and in the past. What your describing is an anti-theist which claims there is no god, and in that sense would require evidence. 1. This usage of ‘why’ presumes that there is some kind of purpose…not saying there isn't some cosmic purpose but so far there's been no evidence to the contrary. 2. Explain what you mean by finely tuned...and are you referring to macro physics or quantum physics? 5. Any good scientist would never assume such a thing. There were scientists that proposed hypothesise and set out to test it. The current model is derived from observing other solar systems, planets, and stars. What makes you think Earth is fine tuned for life? Scientists have discovered micro organisms living on the outside of the space station..in a vacuum. Life has been found deep underwater on fault lines where toxic gases are consistently released. Having liquid water does exponentiate the chances of life but it is not a requirement. 6. What forces are you referring to? Telekinesis? As an atheist myself I do agree with some of the comments made about atheists that are aggressive & seek the argument because I've dealt with them myself, but that kind of behavior isn't exclusive to atheists. 3. Why does life exist? Life is an incredibly complicated organism with thousands of very complex machine like parts that work together to produce a system for reproduction and persistence of the organism in some very harsh environments.. There is a long but very detailed book on this by Stephen Meyer called "Signature in the Cell". This is available from Amazon and there are videos on this on the internet. 4. How have new life forms appeared over time that have major new capabilities that require the working of tens of thousands of new complex machine like parts that work together to form these capabilities? No biological process can explain this..
Two books that discuss this in detail are one again by Stephen Meyer, titled Darwin'a Doubt, and essentially deals with the problem of the Cambrian Explosion. The other is by Michael Behe and is titled "The Edge of Evolution." The problem with the origin of life scenario (#3) and major changes in evolution (#4) is the formation of new proteins. Proteins are extremely complicated parts of the cell that work together with other proteins and sometimes RNA to perform incredibly precise operations. There are 10s of thousands of these in each cell and how they originated is a mystery. An atheist has to explain the origins of many things of which these are three intractable ones. So when I mean belief, I mean belief in how these entities arose. Easy if there was a creator of immense intelligence but seemingly impossible for any other process that does not include a creator in its explanation. Try this link for the fine tuning of the universe (https://www.youtube.com/watch?v=UpIiIaC4kRA) This is entertaining as well as informative. Thank you for taking the time to provide those sources. Its quite refreshing and rare for someone to provide me sources...and from the sound of it you've had to deal with that same issue yourself. So I'll definitely look into them, but first I wanted to reply to your ending paragraphs. Today, new proteins cannot form without RNA. Without RNA there would be no new proteins...at least in its current biological state. This brought on the idea that if RNA can form on its own in plausible conditions then that would be a clue into the origin of life. "Synthesis of activated pyrimidine ribonucleotides in prebiotically plausible conditions" Matthew W. Powner, Beatrice Gerland & John D. Sutherland. Nature, Vol. 460, May 13, 2009. (Link: https://www.ncbi.nlm.nih.gov/pubmed/19444213). Set out to test that and was able to produce a ribonucleotide under conditions scientists have hypothesized to be the possible conditions of a young Earth. Now, a ribonucleotide is only a precursor to RNA and a small piece of evidence, but its another clue in explaining how RNA was formed. Ribonucleotides have also been found in meteorites which leads to the possibility that their formation isn't so rare. But, in any case, the mysteries that science hasn't been able to figure out doesn't mean it won't be able to in the future. Many things in the past have been attributed to a creator (electricity,tornadoes, fire, etc), but once they were well understood and/or proven..the creator idea is no longer needed. So what happens is the goal post gets pushed back each time. So again, an atheist doesn't have to explain these things to be an atheist, but to go down the path saying something's impossible so an intelligent creator did it doesn't aid in learning how something came to be. Lots of verbiage showing that God does exist. Lots of verbiage showing that God does not exist. Strangely the latter asserters appear very content with their conclusion that, ‘nothing” can cause “something” a very Godlike outcome, the exact pattern that Faith assures the Supreme Being used to create. God created everything out of nothing, so in effect if true, honest atheism must crumble into self-doubt annihilating itself, replaced by perhaps Belief, or possibly the much more sensible edifice of agnosticism for them, who might pray, “O my God, if there is a God, save my soul, if I have a soul!” Are all atheists then closet agnostics? Seems sensible to me! Albert Einstein considered the doctrine of Transubstantiation “fascinating” fascinating, no doubt for anyone who thinks about it. Obviously it goes without saying I’m no Einstein, but do find the belief that God created everything out of “nothing” very fascinating. We know “Why” purely out of love, but “How?” Here’s what I think, surely a mouthful! in synopsis, nothing is incapable of anything and is abhorrent to God Who is Everything! Nothingness destroys creativity and is contrary to everything that God is. Somehow, atheists say they believe that out of nothing everything came. Is there a word to say, “Right, but Wrong!” God have mercy on Madalyn Murray O'Hair. This article also appeared in print, under the headline "Renowned atheist is hated, murdered, revived in new Netflix film ," in the May 15, 2017 issue. Jake Martin, S.J., is a special contributor to America.